On June 5th 2012 the planet Venus passed over the face of the Sun for the last time this century. With a forecast for 60% cloud cover in my area I was not very hopeful of being able to witness the transit but at the last moment the clouds parted and I was lucky to be able to capture a few slices of this historic event. About 2 minutes after initial exterior contact Venus is clearly visible taking a small nibble out of the Sun. Venus appears to be about halfway through ingress. 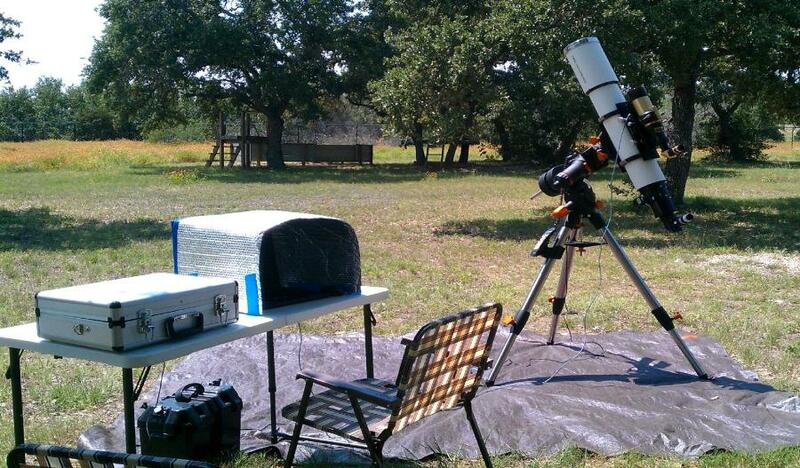 About 30 minutes into the transit things are going well but the clouds are starting to roll in at my location. A heavy layer of clouds moved off and I was able to shoot the Sun for a few minutes before it was lost in a cloudy haze near the horizon. For transit day 2012 I was unable to use my observatory since the walls prevent me from pointing the telescope below about 30 degrees. Instead I setup my "travel" mount in the back yard, a Celestron CGEM carrying the TEC-140 with white light filter for visually observing the transit and the Coronado SolarMax II 60 for Hydrogen-alpha filtered imaging. The camera I used was the Imaging Source 41AU02.AS video camera. For capturing the image sequences I used my old IBM laptop and a custom "solar cover" to shade the monitor and prevent the black computer case from over heating.